After my absence last year in Barcelona 🇪🇸 (IPCAI) and Quebec 🇨🇦 (MICCAI), I am very much looking forward to attending both conferences this year. IPCAI (Information Processing in Computer-Assisted Interventions) will take place from June 20th to 21st in Berlin 🇩🇪, and MICCAI (Medical Image Computing and Computer Assisted Intervention) from Sept 16th to 20th in Granada 🇪🇸. I am especially excited for MICCAI: ImFusion is a proud Silver Sponsor, so we will have a nice booth there with lots of demos – I am hoping for interesting discussions! Talk to you soon! This entry was posted in Common on June 7, 2018 by Oliver. 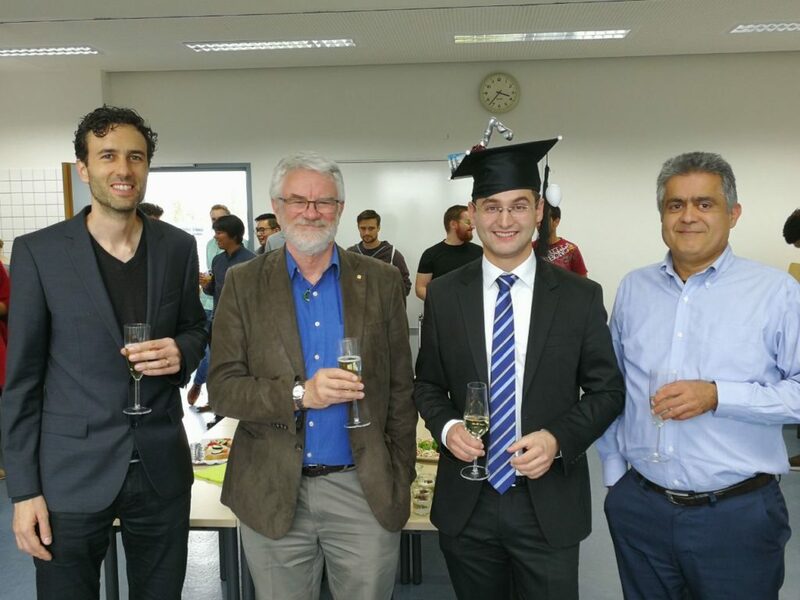 I’m happy to announce that I completed my PhD defense last Friday. Although having left academia (for now) already months ago to a fulfilling industry job, the defense essentially closes this chapter of my life. It has been an enormous time, and I would like to express by deep gratitude to my advisor Prof. Nassir Navab for this guidance, encouragement, and enthusiasm all along the way. I’m already missing you guys in Garching and at IFL! This entry was posted in PhD @ TUM 🇩🇪 on October 8, 2017 by Oliver. 2017 O. Zettinig, B. Frisch, S. Virga, M. Esposito, A. Rienmüller, B. Meyer, C. Hennersperger, Y. Ryang, and N. Navab, “3D Ultrasound Registration-based Visual Servoing for Neurosurgical Navigation,” International Journal of Computer Assisted Radiology and Surgery, vol. 12, iss. 9, p. 1607–1619, 2017. This entry was posted in PhD @ TUM 🇩🇪 on February 4, 2017 by Oliver. 2017 O. Zettinig, J. Rackerseder, B. Lentes, T. Maurer, K. Westenfelder, M. Eiber, B. Frisch, and N. Navab, “Preconditioned Intensity-Based Prostate Registration using Statistical Deformation Models,” in 2017 IEEE International Symposium on Biomedical Imaging (ISBI), 2017, p. 853–857. This entry was posted in PhD @ TUM 🇩🇪 on January 10, 2017 by Oliver. 2016 S. Virga, O. Zettinig, M. Esposito, K. Pfister, B. Frisch, T. Neff, N. Navab, and C. Hennersperger, “Automatic Force-Compliant Robotic Ultrasound Screening of Abdominal Aortic Aneurysms,” in IEEE/RSJ International Conference on Intelligent Robots and Systems (IROS), 2016, p. 508–513. This entry was posted in PhD @ TUM 🇩🇪 on July 8, 2016 by Oliver.